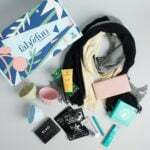 BeautyFIX One-Time Purchase Cyber Monday Deal – Get a Bonus Box FREE! The BeautyFIX Cyber Monday deal is live! Now through 11/27 or while supplies last, use code BFTHROWBACK to get the Thanksgiving Throwback BeautyFIX box free when you buy the November box! Please Note: Right now, the one-time purchase option is still available for the November box, but the monthly option isn’t available. One-time boxes are $34.95. Check out our review for the November box to see exactly what you’ll receive if you sign up! Details: Both the Throwback box and the November box will ship at the same time, and you can purchase this deal as part of a new subscription ($24.95) or with a one-time purchase of the November box ($34.95). Just like the regular subscription, you’ll be able to save 20% on any products from the Throwback box when you reorder from Dermstore. Check out all my Beauty Fix reviews to learn more about this box!